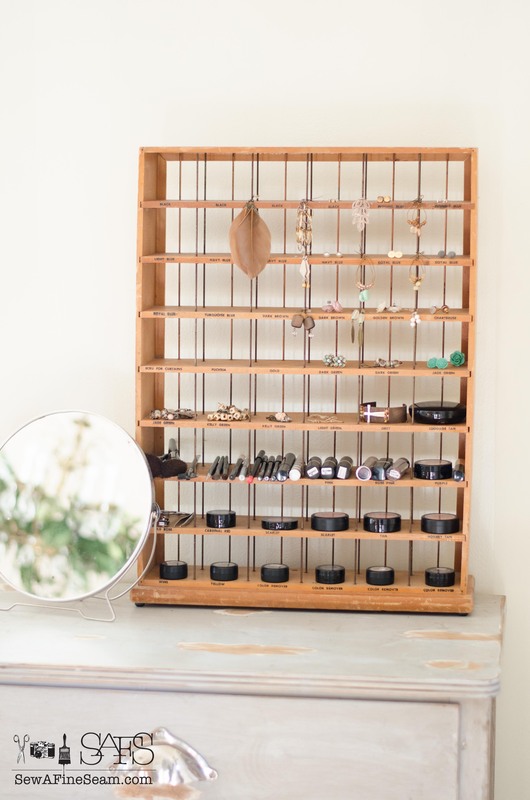 Time for another Junk Revision Challenge and I’m bringing you some awesome Makeup&Jewelry Organization + Vintage RIT Dye Rack! January always seems to bring a flurry and bustle of cleaning and organizing. Maybe it’s partly the new year stretching out like a clean blank slate, a new start, new beginnings. I think it’s a great time to clear out the clutter that invariably happens over 12 months of living and family and happenings. The Christmas decor gets packed up, leaving behind a trail of glitter and ribbon and snowdust and memories. Organizing just seems a great way to start a new year – sweeping out the dust and cobwebs, scrubbing off the old fingerprints and smudges and fluffing the home to make it warm and inviting. I’m thinking a fresh coat of paint for my walls really MUST happen this month. My Jewelry and makeup had become a huge mess. I tried keeping my makeup in the travel bag I started out with but as my collection grew it just wasn’t working. Likewise my earrings. I had my ears pierced a little over a year ago and for several months using a soft jewelry bag was all I needed. But then I started accumulating more and they were becoming a jumbled mess in the bag. I knew I needed to do something but I didn’t know what. 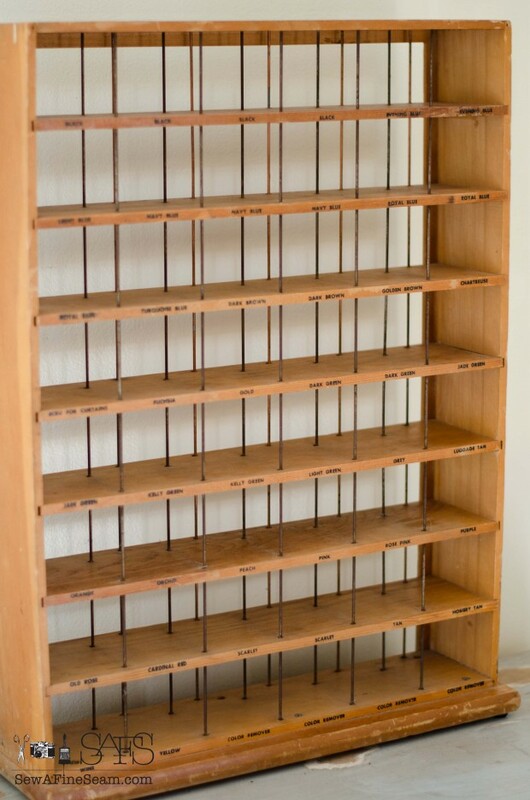 Enter this super cute and fun Vintage RIT dye rack! I bought the rack thinking I might use it for something at the store. 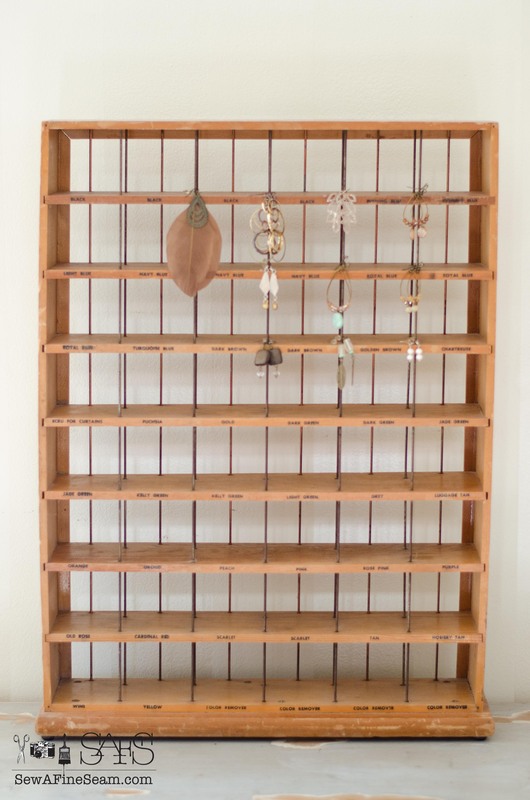 Then one day when I was sifting through my dangly earrings something made me think of the small metal rods on this rack and a lightbulb went off in my head. 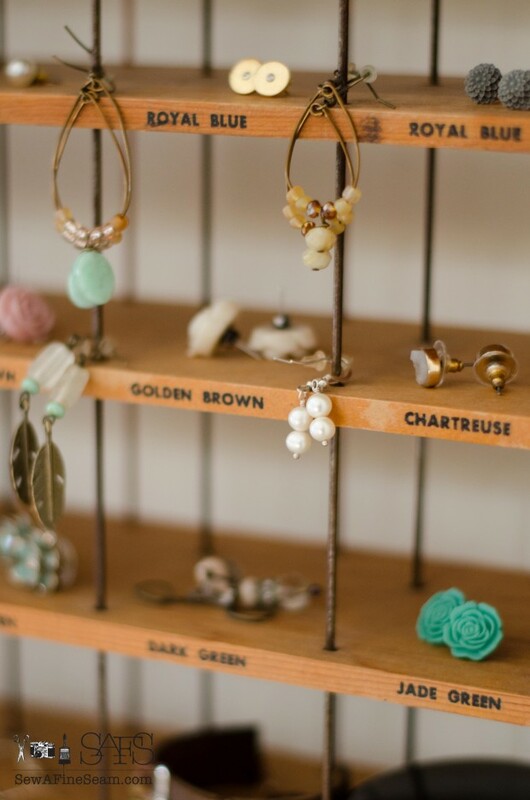 My earrings would hang on those rods perfectly! My post earrings look sweet lying in the spaces that used to hold the RIT dye packs. 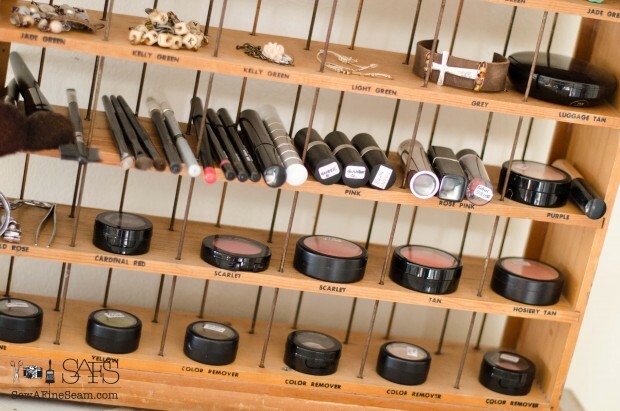 As I stared at the jewelry on the rack I picked up my blusher and eye shadow boxes and randomly stuck them in too. And then I pulled them out and organized them neatly and grabbed my pencils and lipstick tubes and gleefully filled the bottom section of that vintage rack right up! I used the back side of the RIT Dye Rack because it works better for my organization. Just for fun I had to take a shot with the reflected chandi in focus. Yes, the greenery is still gracing my dining room light. Partly because I have yet to get the dining room table cleared off enough to make a mess on it pulling all that dried greenery down. And partly because I’m still enjoying looking at it! I have all the other Christmas stuff packed away and most of the other greenery went in the trash on Monday. But this light will go a little longer and I have a couple bunches of dried bay that I’m still enjoying. 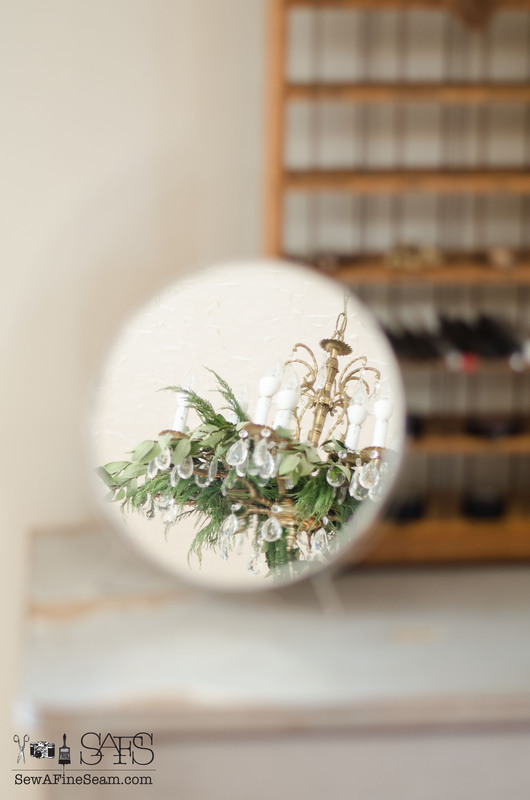 Dried bay leaves last a long time and they can be pretty in decor clear through Easter – just add some Easter touches to it and it looks amazing. Happy organizing, purging, pitching, storing, cleaning, and fluffing! 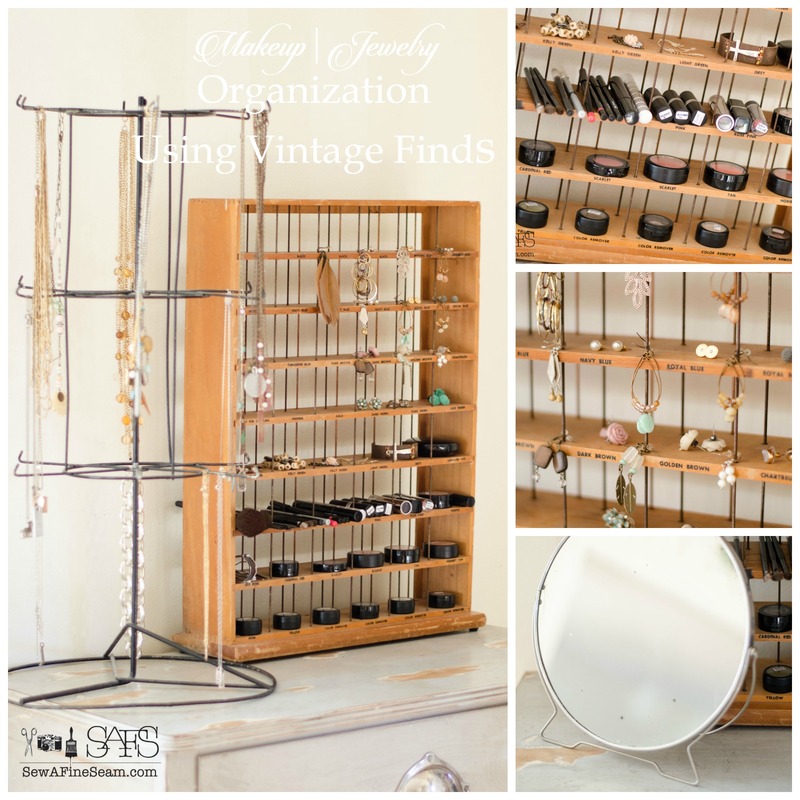 Now go see what my friends found to use for organization! 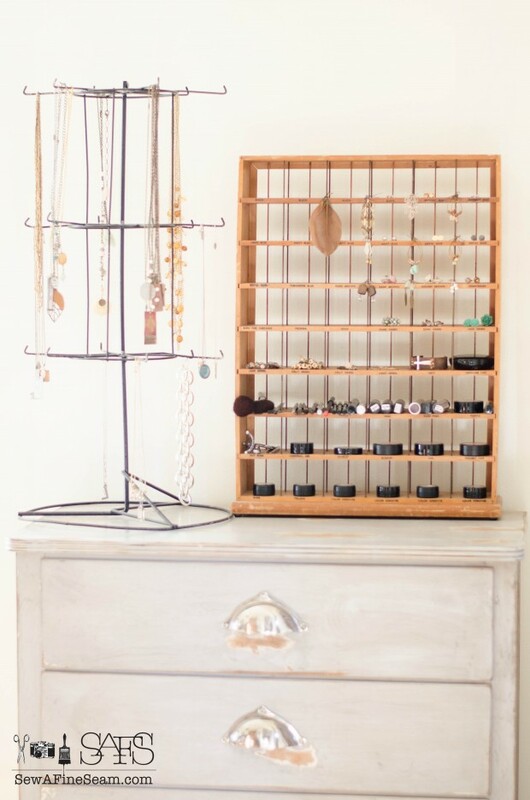 🙂 It does seem we all need some jewelry organization 🙂 I wish the organizing and purging went faster and then lasted longer!! Jill, what a great find! I like the names of the dyes along the vintage wood. 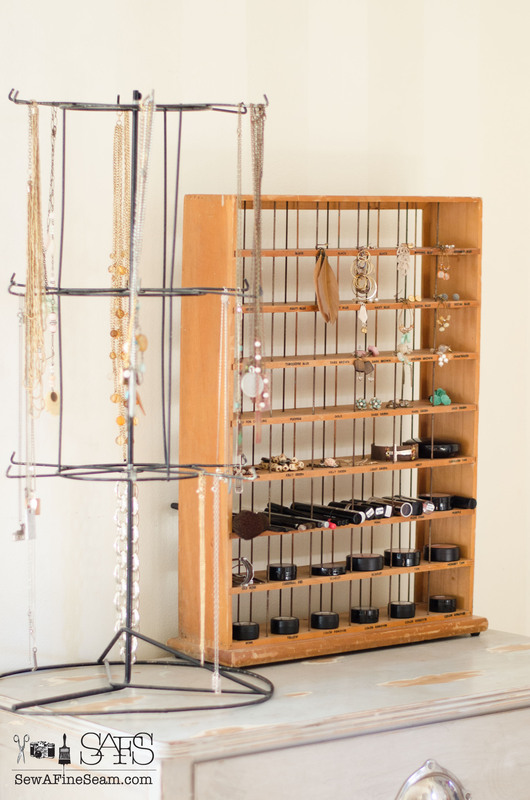 I’m in need of something to hold jewelry and vintage store displays would be perfect. I like the way the names are on there too! Goes well with my sewing/crafting/DIY theme! I always enjoy your stories Jill. I don’t remember these crates but this is a great use for it but then you always have awesome ideas. 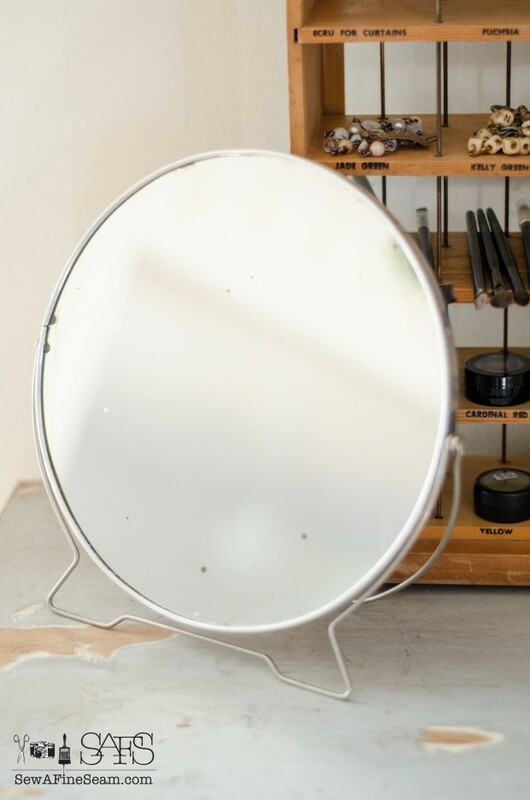 Love the mirror – such a wonderful memory. 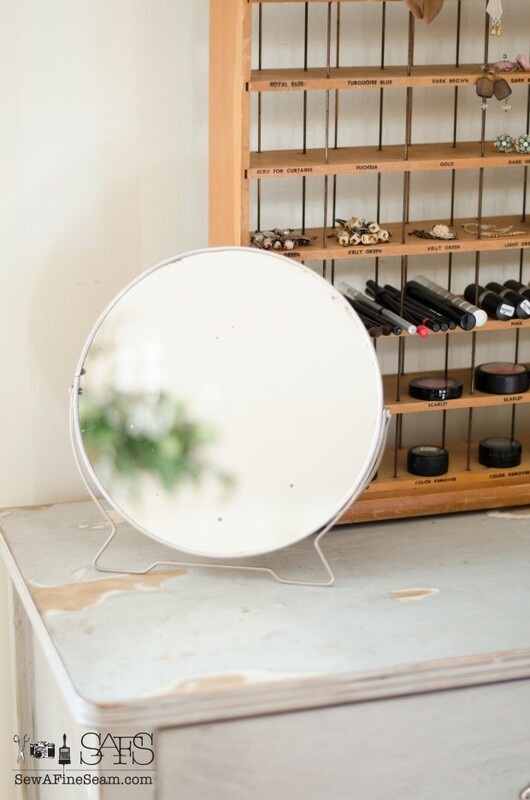 What a great storage piece ! I like storage where you can still see everything rather than it being hidden away. Me too Claire, I am so happy with this piece! This is so creative! I really need to organize my jewelry. Somehow my earings just seem to disappear. Great job! Thanks for the inspiration. Thanks Carrie, I really like how this works for my earrings – I like to be able to see what I have without digging through a box of bag! Great idea, Jill. It just goes to show you that you can almost always make an old item into a new and useful one. This is a very convenient and handy way to have your jewelry and makeup at your fingertips. Yep you sure can! I love vintage finds! Great idea!!! I love how every little spot can be used for even more organization. 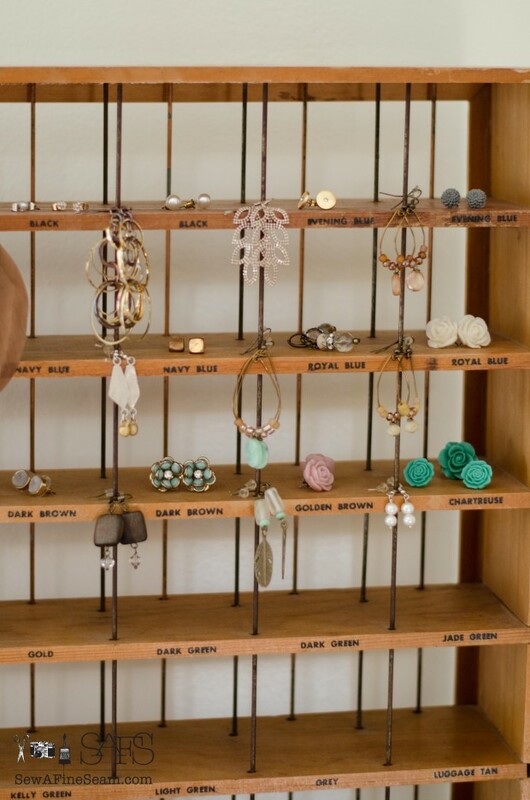 I love the new idea for jewelry organization. 🙂 Pinned and sharing! Thanks Stephanie, I’m so glad I thought of using it for this – I just love it! Thank you so much Amy! Praying our friends can be heading off soon to get their son! Really nice idea! I am about to start with cleaning and organizing, so I was looking for ideas to store my jewelry and make up. 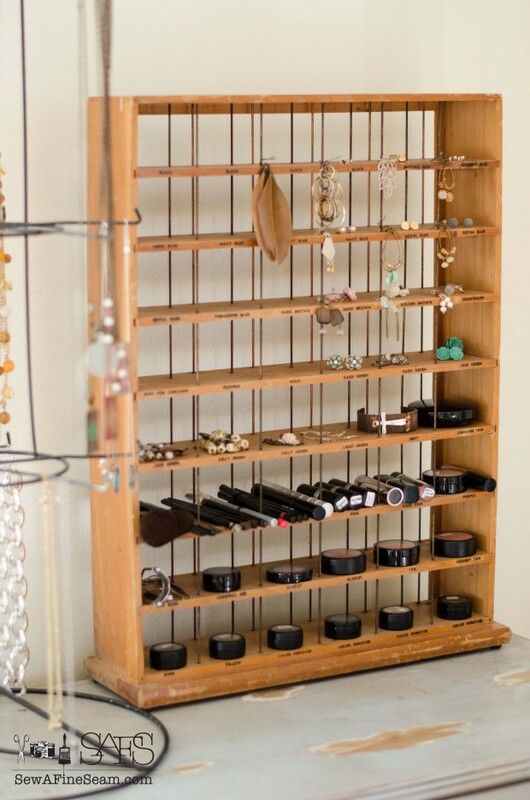 I think that this rack is very beautiful and perfect to be used for this purpose! I really love the way you organize your lovely things. Thank you for sharing! 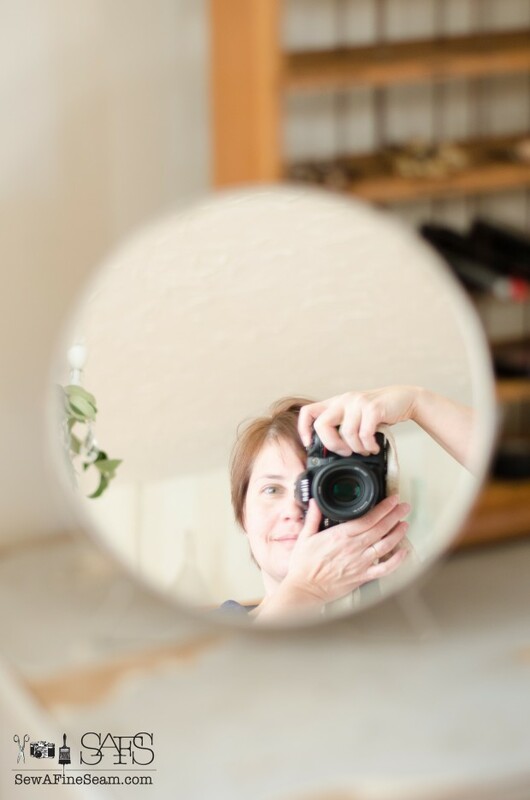 Thank you Lisa – I have used this for awhile now and I just love it so much! It’s perfect for my needs!